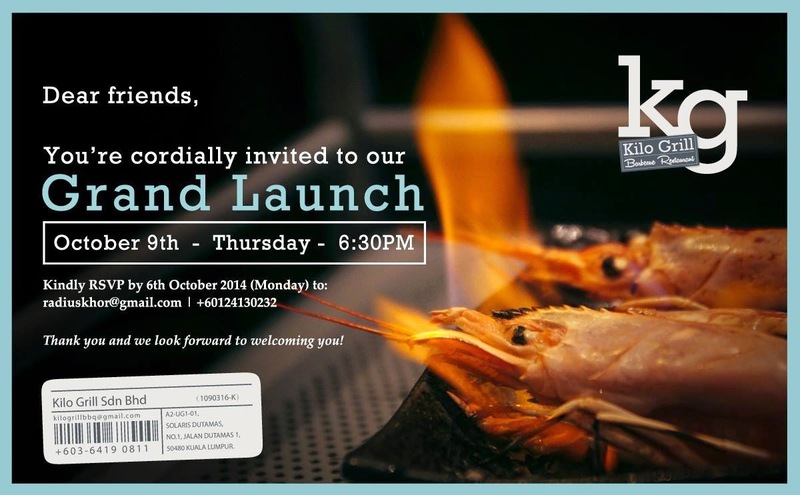 It's such a privilege to be invited to the Grand Launch of Kilo Grill Barbecue Restaurant! Special thanks to Sidney for the recommendation :D This restaurant may look like your usual Korean barbecue restaurant, but it's actually a World Barbecue Cuisine concept restaurant! What's so special about this barbecue restaurant are the types of meat they serve. You'll find the Iberian Black Pig (3 of their best parts for grilling: jowl, collar and belly), John Ross Jr Smoked Salmon, & Sashimi-grade Argentinian Sea Prawns, just to name a few. As it is a World Cuisine Barbecue concept restaurant, you can look forward to various types of meats, dips, & variety from all over the world! For the Grand Launch, we were treated to free-flow of the smooth Taiwanese beer on their conveyer belt, which the conveyer belt will be used for their plates of vegetables during normal business hours. Every barbecue set will come with a selection of vegetables that are readily available from the conveyer belt, so just pick & choose the vegetable of your preference :) They have vegetables like zucchinis, pumpkins, broccoli, cherry tomatoes, asparagus, oyster mushrooms & more. One of their appetizers served that evening was the Special KGC Tenders. It's a thumbs up! So crispy on the outside, tender & moist on the inside. We kept popping these tenders into our mouths! PerutBesi certainly recommends this! There were at least 3 different types of dips available for the meats. You can enjoy the meat just as it is or dip it into the special sauces. Top clockwise: Korean bean-paste dip (best for pork), Capsicum & chilli dip (best for seafood), & Sweet+Spicy Japanese Yakitori dip (best for any meat). These grilled baby octopus goes so well with the capsicum dip! It's lightly barbecued on the outside with alcohol flames & still fresh/raw on the inside like sashimi. Oh-so-nice!! I love the slight charred/grilled aroma, the freshness & sweetness of the huge prawns! The Grand Launch concluded with the very innovative & creative Petai Ice-Cream with Chocolate Brownie! Those who aren't fans of the stinky petai beans could actually be converts at Kilo Grill! Enjoying a barbecue meal here at Kilo Grill is another class of its own. The unique, global variety & most importantly freshness of ingredients are certainly plus points for this 'new kid on the block'! CONGRATULATIONS on your Grand Launch, Kilo Grill Barbecue Restaurant!